Exploding Kittens made history when it became the most-backed game in Kickstarter history and the campaign with the most number of backers, ever. It is a highly-strategic, kitty-powered version of Russian Roulette. 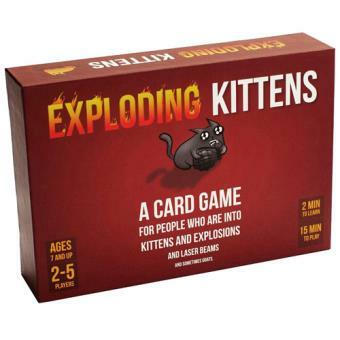 Players draw cards until someone draws an Exploding Kitten, at which point they explode, they are dead, and they are out of the game — unless that player has a Defuse card, which can defuse the kitten using things like laser pointers, belly rubs, and catnip sandwiches. All of the other cards in the deck are used to move, mitigate, or avoid the Exploding Kittens. Divertido para jogar com a família.